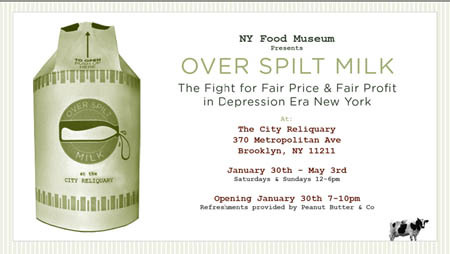 …The show will feature documents and artifacts from the 1930s, when immigrant Meyer Parodneck and a handful of anti-poverty activists founded the Consumer-Farmer Milk Cooperative to ensure farmers received a fair price, and consumers paid a fair price, for milk. The Co-op played a pivotal role opening the market controlled by milk distribution giants. With their own processing plants and distribution stations, the Consumer-Farmer Co-op sold milk to consumers at the lowest possible price, and paid farmers the highest possible return, for nearly fifty years. Overcoming a mountain of obstacles, this organization made a difference to hundreds of struggling farmers and to the children of low-income New Yorkers. The exhibition includes period Co-op newsletters and advertising campaigns, vintage paper milk containers, and cooperative movement propaganda. Pivotal moments in the Co-op’s story are illustrated with miniature dioramas. This event will not only set you back absolutely nothing, but salmonella-free refreshments courtesy of Peanut Butter Company will be in the offering. Yummy. January 30, 2009, 7:00 – 10:00 a.m.